Dr. Keiluweit’s research broadly focuses on the response of soil processes to climate change. The main goal of his research is to understand the effect of changing environmental conditions on fundamental ecological mechanisms that control the fate of essential elements, most importantly the cycling and storage of carbon. Dr. Keiluweit’s research group investigates abiotic and biotic mechanisms that couple the biogeochemical cycling of C to that of other ecologically relevant elements such as Al, Fe, Mn, N, and P. In order to examine the relevance of these mechanisms across multiple scales, he combines laboratory model systems with in-field measurements. 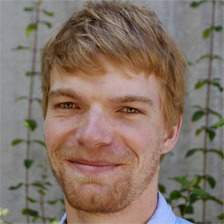 He specializes in using fine-scale in-situ microsensor techniques as well as novel, synchrotron-based imaging and spectroscopy analyses to characterize interactions among C compounds, microbes and minerals in a diverse array of soil microhabitats: litter layer, rhizosphere and deep soil. His research integrates soil science with modern microbiology, ecology, and geochemistry approaches–both in the lab and in the field–to address questions concerning the impacts of climate and land use change on soil processes and ecosystem functioning. The role of mineral-organic interactions (sorption, precipitation, aggregation) in soil carbon dynamics, specifically their formation and turnover. Redox coupling between reactive metals and carbon cycling, particularly the role of redox active metals in the abiotic and biotic breakdown of organic compounds. Keiluweit, M., Nico, P.S., Harmon, M.E., Mao, J., Pett-Ridge, J., and Kleber, M. (2015) Long-term litter decomposition controlled by manganese redox cycling. Proceedings of the National Academy of Sciences 112(38):E5253–E5260. Keiluweit, M., Bougoure, J., Nico, P.S., Weber, P., Pett-Ridge, J., and Kleber, M. (2015) Mineral protection of soil carbon counteracted by root exudates. Nature Climate Change 5: 588-595. Klüpfel, L., Keiluweit, M., Kleber, M. and M. Sander (2014) Redox properties of plant biomass-derived black carbon (biochar). Environmental Science & Technology 48, 5601–5611. Soil plays a critical role in global carbon cycling, having a dynamic carbon stock in the form of soil organic matter (SOM) that is three-times larger than the amount stored in the atmosphere. Increases in microbial mineralization of SOM could alter the soil C balance and undermine these massive C stocks. Because loss of C from soils releases additional CO2 into the atmosphere and diminishes a soil’s fertility, there is a broad debate how microbial mineralization rates will respond to future climate change impacts. Dr. Keiluweit studies how changing environmental conditions (e.g., changing soil temperatures, plant inputs, soil moisture etc.) affect the fate of C in soils, particularly how C enters the soil via plant roots, is metabolized by microbes, and binds to minerals in protective mineral-organic associations.